The Bharatiya Vidya Bhavan, Kuwait Kendra, has been conducting Entrance coaching classes for JEE(mains), JEE (Advanced), NEET for classes 11 and 12, ACCA/CPT (For CA aspirants) and IIT foundation classes for students of classes 7 to 10. Within a short span of 6 years, it has gained name and fame amongst the Bhavanites, and the students of other Indian schools in Kuwait. 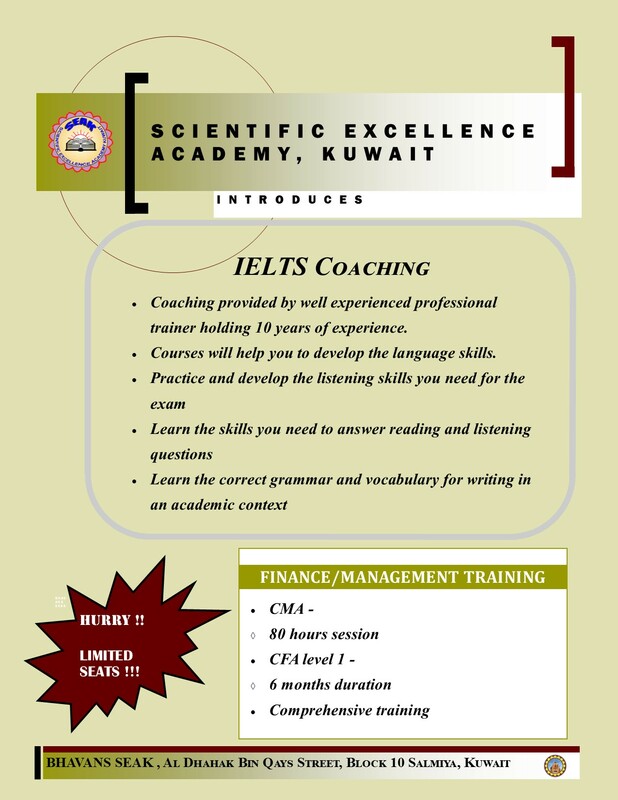 The centre has started to function independently under the name SCIENTIFIC EXCELLENCE ACADEMY , KUWAIT ,(SEAK) in Salmiya( Block 10, Al Dhahak Bin Qays Street) . The centre conducts tutorial sessions for cbse classes 7 to 12 in Maths and Science. IIT foundation classes for 7 to 10. A screening test will be conducted in the month of March 2018, at the Scientific Excellence Academy, Salmiya. Admissions will strictly be based on the scores of the test. The class timings for IIT foundation will be on Saturdays From 8 am to 3:15 pm: 2 sessions each for Physics, Chemistry and Maths. 1 session in Logical Reasoning, Biology and Finance. Transport facilities are given by the school on request. Interested parents are requested to submit the enrolment form (click here), duly filled in . Registered candidates for the JEE ( only class 10 seeking admissions to IITs & NITs ) screening tests will receive a specimen question paper , for practice.